Paneer/Indian cottage cheese is rich in calcium and vitamins and I like anything made with paneer even I can have the fried paneer as such. 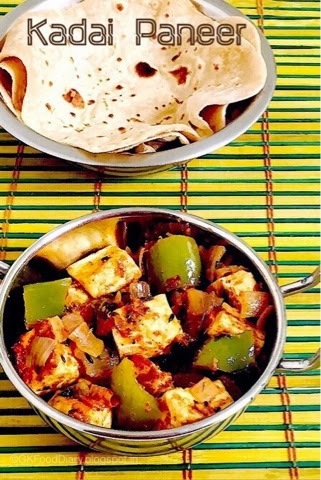 This kadai paneer recipe is semi dry version with freshly ground spices and capsicum. We often make this at home and pair it with Chapati/pulka or even mild pulaos. 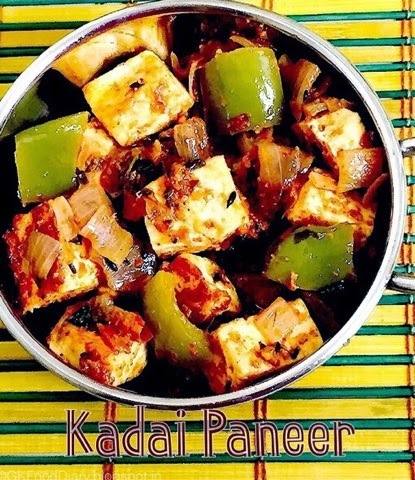 Kadai paneer is hubby’s favorite and he used to order it without fail when we visit vegetarian restaurants. 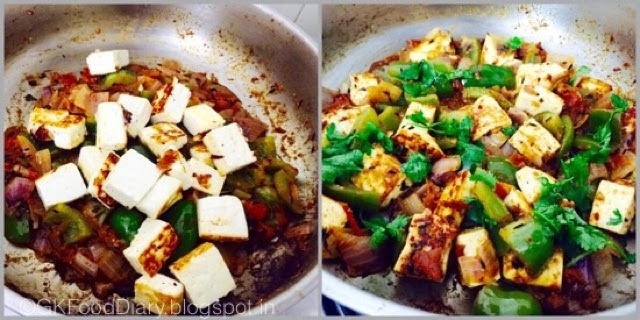 So I have tried recreating the restaurant style kadai paneer at home. It turned out super good and he liked this more than restaurant ones?. Dry roast coriander seeds and red chillies in a kadai until nice aroma comes. Then grind it to a coarse powder in a mixer. Set aside. Cut onions and capsicum to cubes. Chop tomatoes roughly. 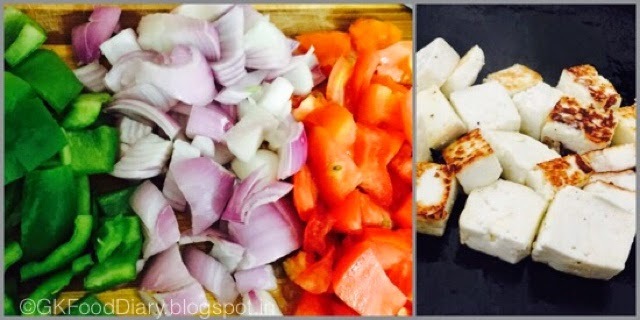 Keep aside.Cut the paneer into medium sized cubes and fry it in a tsp of oil until golden brown. Keep it immersed in warm water till use. Heat oil in a pan and add cumin seeds. Saute them until cumin seeds cracks. Add onions now along with ginger garlic paste and saute them well. Once the onions becomes transparent, add the tomatoes in. Fry the tomatoes until it becomes mushy and soft. Then add the ground spice powder,red chilli powder, coriander powder,garam masala powder and salt. Mix everything together. Then add capsicum pieces. Mix the capsicum with the gravy. Fry it for three minutes until the capsicum slightly changes it color. 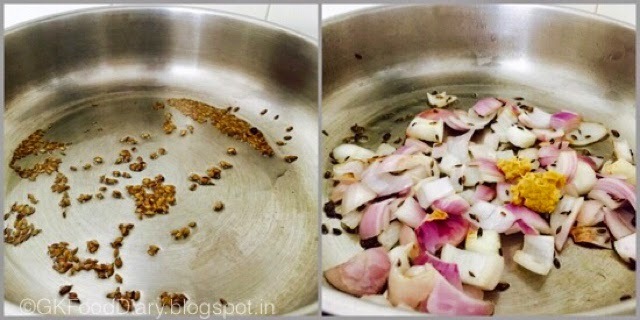 Now add kasuri methi and fry for a minute.Then add ¼ cup of water and mix it well. 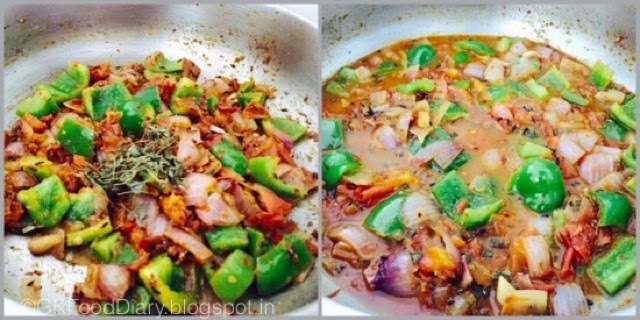 Cook the gravy in medium flame until the capsicum is cooked. Make sure the capsicum is cooked and retains its crunchiness. By now the curry would become semi-dry. Then add fried paneer pieces and carefully mix it with the curry. Fry it for 2 more minutes. Switch off the flame once done and garnish with coriander leaves. 1. Dry roast coriander seeds and red chillies in a kadai until nice aroma comes. Then grind it to a coarse powder in a mixer. Set aside. 2. Cut onions and capsicum to cubes. Chop tomatoes roughly. Keep aside.Cut the paneer into medium sized cubes and fry it in a tsp of oil until golden brown. 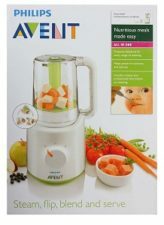 Keep it immersed in warm water till use. 1. Heat oil in a pan and add cumin seeds. Saute them until cumin seeds cracks. Add onions now along with ginger garlic paste and saute them well. 2. Once the onions becomes transparent, add the tomatoes in. Fry the tomatoes until it becomes mushy and soft. Then add the ground spice powder,red chilli powder, coriander powder,garam masala powder and salt. Mix everything together. Then add capsicum pieces. 3. Mix the capsicum with the gravy. 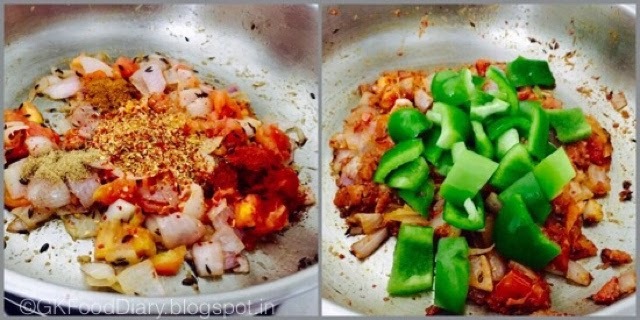 Fry it for three minutes until the capsicum slightly changes it color. Now add kasuri methi and fry for a minute.Then add 1/4 cup of water and mix it well. 4. Cook the gravy in medium flame until the capsicum is cooked. Make sure the capsicum is cooked and retains its crunchiness. By now the curry would become semi-dry. Then add fried paneer pieces and carefully mix it with the curry. Fry it for 2 more minutes. Switch off the flame once done and garnish with coriander leaves. 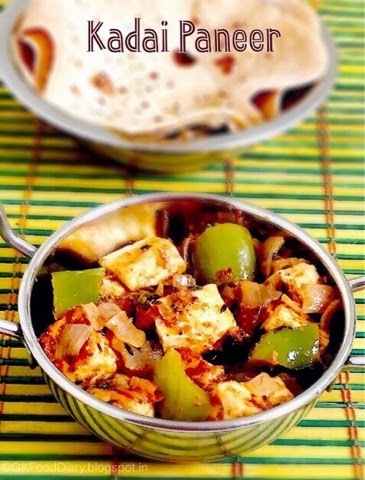 The tasty restaurant style kadai paneer is ready! Serve it with Chapati/phulka. Tastes yum! 1. I like cubed onions in kadai paneer so chopped it to cubes. You can finely chop the onions too. 2. This is medium spicy curry with the above mentioned ingredients. 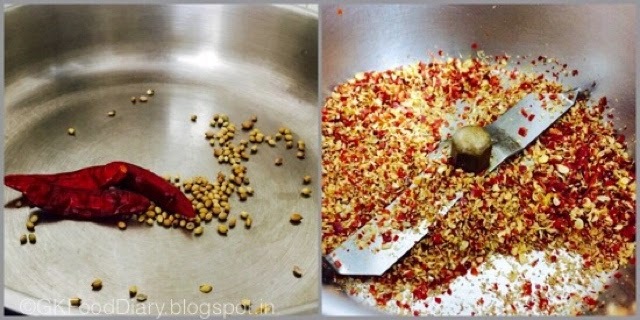 Increase red chilli powder if you want it more spicy. 3. Don’t skip kasuri methi as its add a great flavor to the curry.